Should you lose your instructions for the 'AGA' Mini-test, here is a replacement copy, downloadable from our site, in adobe 'pdf', which may be opened in Adobe pdf reader, versions 8.0 and later. The Mini-test may be used to check test the performance of all these Interspiro (or AGA) marques but this instruction number is specific to diving equipment but the instruction can be used * with the other BA listed here, when the model's test data is known. * For example: Spiromatic breathing valves are set to a static mask or buccal pressure of between 25 and 40 mm/water column; whereas the Divator (positive pressure) is set to between 3.4 and 4.0 mm/water column but, in both these cases, the dynamic pressure at 2 litres/second (constant flow) should reveal steady pressure of > 20 mm. MOTIVOX oxygen kits are set to lower breathing effort, the breathing valve responding to pressure changes as low as +/- 0.5 mm (5 Pa) but the only time that MOTIVOX are set up to offer positive pressure is for PEEP (positive end exhalation pressure) versions. PEEP is a technique used to increase alveolar gas distribution and help prevent pulmonary oedema, usually for post-operative patients and diving casualties where oedema or damaged alveolar tissue is suspected. Here, PEEP is factory set to 60 mm, at a respiratory minute volume (RMV) of 40 litres/minute and mean dynamic pressure is set at 40 mm. Our PEEP system is very useful for diving incidents, helping increase gaseous perfusion rates and therefore desaturation blood nitrogen at faster rates, more safely that without the PEEP MOTIVOX. That positive pressure is maintained, at demand exceeding 5 litres/second. That the 'second' stage air supply offers adequate flow and no high pressure leakage, from the first-stage. That Divator B/Vs are water tight and that the NR valve functions adequately. 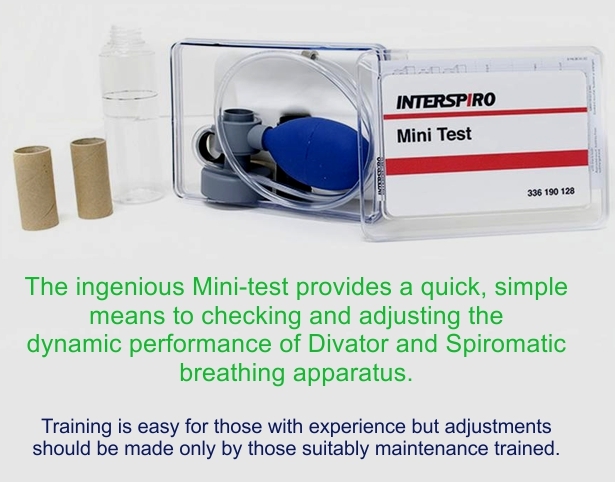 Click the button below to add the Instructions for Mini-test apparatus for AGA/Interspiro SCUBA to your wish list.